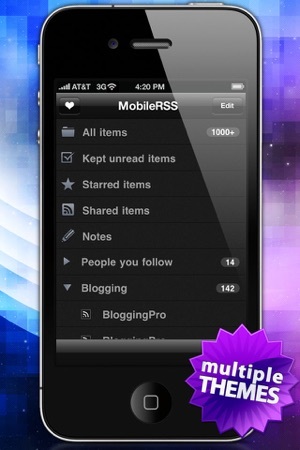 MobileRSS is a fully-featured Google Reader client for iPhone, iPod Touch, and iPad. We've built a ton of powerful and exclusive features onto an elegant and familiar design platform which makes reading the news fun again. We think you'll like it! 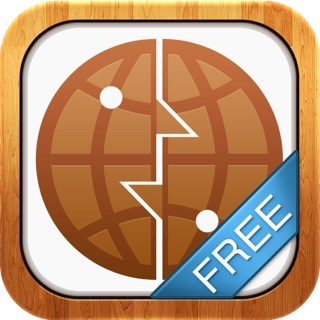 This free version of MobileRSS has ads which can be removed by upgrading to the ad-free MobileRSS Pro. ★ Detailed setup page allows full customization of your reading experience. ★ Feed and folder management make adding new feeds a cinch; search by keyword to discover new sources! ★ Effortlessly share your favorite articles via email, Facebook, Twitter, Instapaper and more. ★ Supports offline reading. 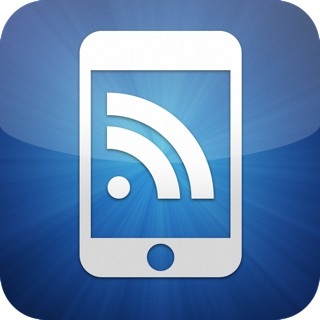 Download everything via Wifi and read news from your favorite sources on the go. 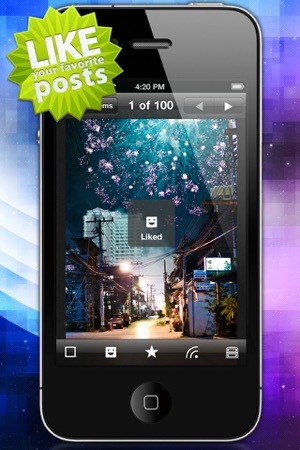 ★ Native support for iPhone 4 including the gorgeous Retina Display and background tasking. ★ Tons of other features like full screen article viewing, rotation lock, landscape view, swipe gestures, image saving and much more. I use an iPhone 4 with a limited AT&T data plan. When I started reading blogs a few weeks ago, my data usage skyrocketed. The blogs I read have a lot of high-quality pictures, and the size of the files added up quickly. 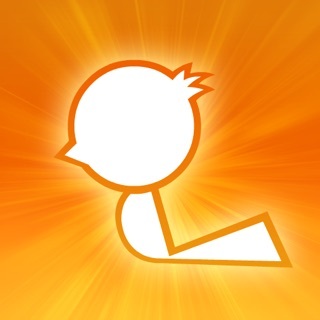 I tried Feeddler first because it was rated higher, but not only was it not as easy to use, it also didn't have a "Wi-Fi only" option that I could see, but a lot of the features were grayed out and unavailable unless you had the paid version. The free version of MobileRSS is great, though! The ads are in a very small bar across the top of the screen, and they are not intrusive or distracting. Have been using this app for about a year and for the most part I love it. It is intuitive and easy to use, it has most of the features that I want and is a comfortable reading experience. However in the last few months occasionally it will load a post and then it loads a page of web links to advertisements instead. Sometimes reloading the post will work, but many times you have to turn the app off and come back to it later to read the post. 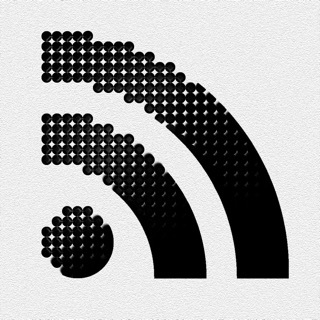 Because of that I have downloaded several other RSS reader apps but I keep coming back to this one because I don't like the others as much. Even with this glitch it is a much better app. I just purchased the ad free upgrade to this app last night. 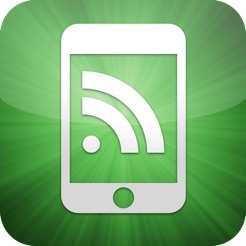 After trying so many other Google Reader RSS clients, this one was perfect. It had ALL the features and customizability that was needed, plus was very aesthetically pleasing. Now that I upgraded, I can no longer view the full article within the app, like I could do with the free version. So I basically just invested in an app to remove ads and enjoy the experience - to lose the main functionality that the app exists for.... That's not okay! After reading the comments from other now unsatisfied users, I really see that this developer needs to fix a few things, and ASAP! I'm rating 2 stars because of having spent my money to lose the functionality I just purchased.